“Based on links to those specific asteroids, we can talk about the longer history of Ryugu,” said planetary scientist Seiji Sugita of the University of Tokyo in a March 19 news conference at the Lunar and Planetary Science Conference. 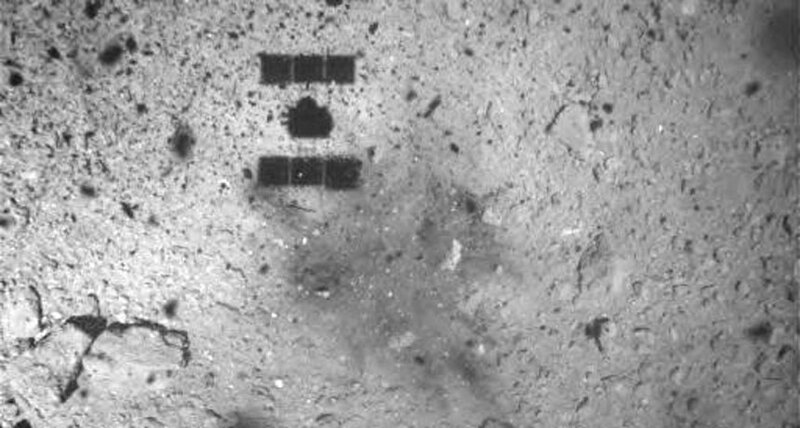 Ryugu’s small size, about 900 meters across, and its rubble-pile nature make scientists think the asteroid formed after the breakup of a larger body some 700 million years ago. Based on Ryugu’s orbit, which takes the space rock within 95,400 kilometers of Earth, astronomers think the asteroid probably came from the inner part of the solar system’s main asteroid belt, which sits between Mars and Jupiter. But it was hard to narrow down Ryugu’s origins any further until the Hayabusa2 spacecraft arrived at the asteroid in June 2018 (SN Online: 6/27/18). Hayabusa2 showed that Ryugu is uniformly dark, one of the darkest known objects in the solar system. Its color best matches that of main-belt asteroids Polana, which is about 55 kilometers wide, and the 37-kilometer-wide Eulalia, Sugita said. He put the odds that Ryugu came from one of those two bodies at about 80 to 90 percent. Ryugu’s chemistry suggests that its parent asteroid had some water in its rocks early on, but lost much of that water before the breakup that led to Ryugu. Pinning down the timing of Ryugu’s water history could help scientists understand how water may have been delivered to Earth by asteroids in the early solar system. The real test of Ryugu’s origins will come when Hayabusa2 returns a sample of the asteroid to Earth in late 2020, and scientists can measure the space rock’s age (SN: 1/19/19, p. 20). An older Ryugu would suggest that the more ancient Polana is the parent, while a younger sample would point to Eulalia.